Yesterday’s post about nuPROTO’s troubles for making a 3D printed iPhone Throne Dock got me thinking about proprietary designs and interfaces (and how to double down on this blog’s newly minted nerd-factor). A couple of years ago, there was some excitement about people printing and designing replacement pieces for the board game Settlers of Catan. Users like tedparsec on Shapeways (a site that lets you order 3D printed goods) and Sublime on Thingiverse (a site for sharing 3D printable designs) had designed and uploaded their own replacement tiles and pieces for the board game. The Thingiverse designs were freely traded, but in the case of Shapeways, you could (and can still) actually purchase them. But have any of game designer Klaus Teuber‘s rights been infringed? At the time, Michael Weinberg at Public Knowledge (who has produced some of the most comprehensive work on 3D printing law out there right now, which we will review here in due course), posted about why 3D printing your own pieces for the board game Settlers of Catan is actually probably not illegal. Weinberg says copyright may protect the design of the tiles, but the 3D printed tiles aren’t copies in that sense. No patents appeared to cover the rules of the game. And although Settlers of Catan is a registered trademark in at least some jurisdictions, at least Sublime had only mentioned the game to say the pieces are compatible. Weinberg says that it’s not necessarily a question of whether it is illegal, but really a policy question about whether it should be illegal. What’s interesting is that while the makers of Catan appear to have tolerated the 3D game board pieces, they were not happy when someone made a software version of the Catan board that ran on the Android platform. Weinberg argued that Catan’s threat against the Android developer was also not backed up by the law, though the developer relented and removed his app. I’m a bit less certain – I’m writing a whole post about ‘trade dress’ issues in trademark law relevant to 3D printing. But for now, I want to consider a different question: Aside from legal correctness, why tolerate 3D printed boards but not software boards? 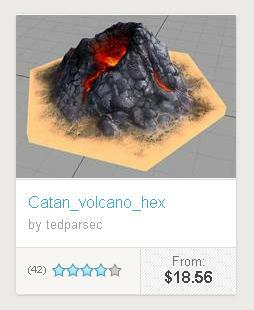 Catan sells both physical replacement pieces as well as their own Catan app. Maybe the answer is that they perceive a bigger business threat from software than physical goods. Or perhaps it is that digital copying is simply more familiar.